Oriental Mustard (Sisymbrium orientale) is a dicot weed in the Brassicaceae family. 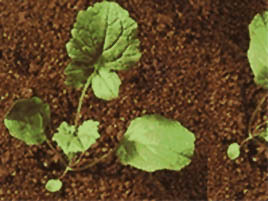 In Western Australia this weed first evolved resistance to Group B/2 herbicides in 1994 and infests Cereals, Spring Barley, and Wheat. Group B/2 herbicides are known as ALS inhibitors (Inhibition of acetolactate synthase ALS (acetohydroxyacid synthase AHAS)). Research has shown that these particular biotypes are resistant to chlorsulfuron, and metosulam and they may be cross-resistant to other Group B/2 herbicides. Resistant to sulfonylureas and metosulam. Can use the phenoxy herbicides, thus the cost is not more to control this species. Resistance was confirmed to SU and triazole pyrimidine herbicides in a glasshouse expt. ALS inhibitor resistant Indian Hedge Mustard is becoming a major problem in Western Australia. Laboratory trials comparing a known susceptible Oriental Mustard biotype with this Oriental Mustard biotype have been used to confirm resistance. For further information on the tests conducted please contact the local weed scientists that provided this information. There is no record of differences in fitness or competitiveness of these resistant biotypes when compared to that of normal susceptible biotypes. If you have any information pertaining to the fitness of Group B/2 resistant Oriental Mustard from Western Australia please update the database. The Herbicide Resistance Action Committee, The Weed Science Society of America, and weed scientists in Western Australia have been instrumental in providing you this information. Particular thanks is given to David Bowran, Abul Hashem, Jim Phimster, and Christopher Preston for providing detailed information.